After an amazing few weeks training in Europe at altitude with super-awesome people, it was finally time for the World Championships, held at 1,900+m atop a mountain in the Andorran Pyrenees at the ski resort of Vallnord. 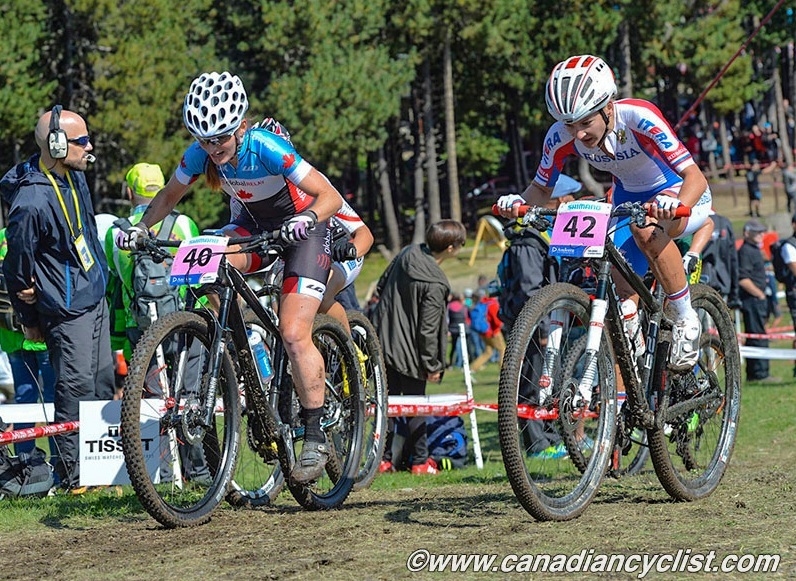 My first rides on the course gave me the impression that the race would be dry and fast, as the top women’s relay lap times were hot – under 15 minutes. Athough there weren’t any major features, I liked the course for its variety, natural techy singletrack, and stunning views. It ranged from long sections of grassy ‘cross-esque switchbacks (up- and- down) and STEEP lung busting climbs to awkward rocky traverses and ripping rooty trails. It was just plain fun and it felt like I was really mountain biking. But then things changed. It started to rain after the junior races on Thursday night and it rained straight through both U23 races on Friday. Catharine, Mike, and I pre-rode early on Friday morning as it poured torentially. I was fully decked out in rain gear: Gore-Tex jacket and booties and plastic rain cover on my helmet (which people razzed me for, but I was grateful to have it)! 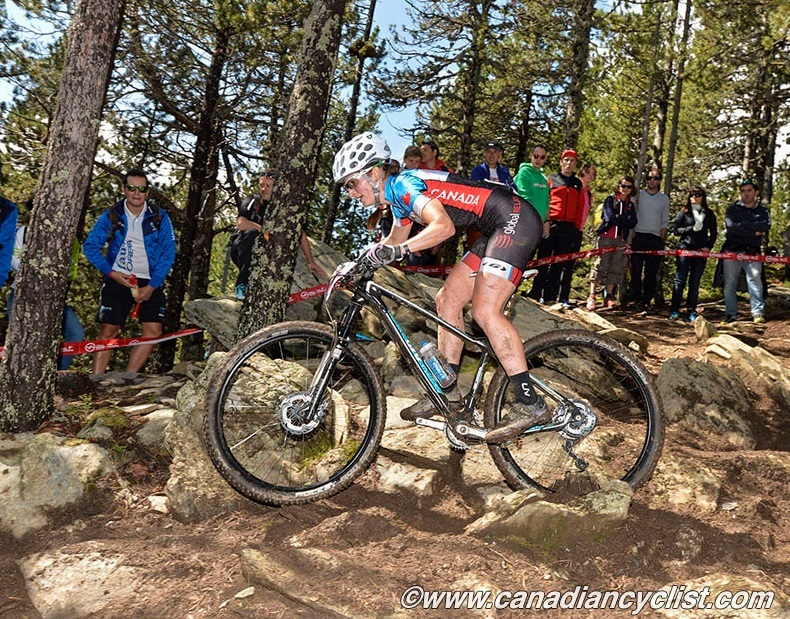 Before the U23’s raced, grip was actually amazing on course, as the pouring rain kept roots and rocks free of sticky, slippery mud. We had so much fun slip-sliding around grassy turns and whooping as we let our bikes do their thing on drenched descents. It stopped raining late that night, giving the course approximately 12 hours to dry out before the elite women’s race, but it wasn’t enough. The damage had been done. On race day, despite the blue skies and sunshine, the course was rocked from being raced on in the wet and it hadn’t dried nearly enough to make things easier. In fact, it had dried just enough to thicken the mud and make the entire course treacherous and the previously easiest sections unrideable. I was happy I chose more aggressive tires, although I was still caught out running. A lot. Uphills, downhills, sidehills… it didn’t matter, I was running. And when I could ride, I felt like a snail, like I wasn’t making any headway. On the descents, I’d lost all of my skills. Despite the saturated conditions, which obviously made the course way slower than when it was dry (winner Pauline Ferrand-Prevot’s fastest lap was now over 18 minutes! ), officials decided to keep our lap count at the original six, meaning the winner’s race was nearly two hours long, way over the target time of 1.5 hours! I was out there for two hours and seven minutes — all of them amazing! Amazingly fun at times, amazingly frustrating at others, and amazingly hard at most. But, of course, I embraced the challenge and made every long minute count. 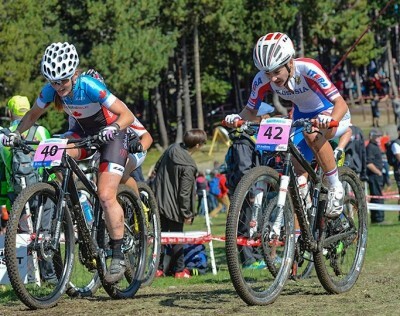 I moved up throughout the race and had some exciting back-and-forth battles with other riders. I learned that if I actually backed off a bit and focused on riding every section as cleanly as possible, I actually was net faster. When I made that conscious decision, I finally shed the group of riders I was bumbling around with (It was on a constant loop: I would pass one, then crash. Then one would pass, then crash. Then I would pass back and make a mistake, etc). On the steep climbs, I was pleased I’d decided to put aside my single ring setup and go with a double. The easier gear was a game changer and I was able to maintain a decent pedaling cadence, while many of my competitors were doing all they could to grind out whatever too-tall gear they had. Overall, I think my considerable racing experience and general unwillingness to give up paid off in spades. When I finally crossed the finish line, I didn’t even know what position I had placed, but Dan told me I was 30th, so I was cool with that. My previous best Worlds had been 34th, so another PB! All right! Dan went on about how awesome my ride had been and how well I had done, but I didn’t really believe him. I had this crazy painful stitch in my side (It was only the second time I’ve ever experienced a side stitch on a bike, although it’s a regular occurrence while running. The first time was earlier this year at the Pan Am Championships in Colombia — also at altitude, so I’m guessing it’s something to do with my breathing). I had to go spin it out a bit before I could think of what to do next. Afterwards (in the evening when I was back at the apartment) I discovered I had actually finished 27th! Even better! And the comforting thing was that every other rider I spoke with about the race said they felt the same way as I had… slow and inept at riding a bicycle. I was relieved to hear that it wasn’t just me… that the best riders in the world had felt less-than-stellar. 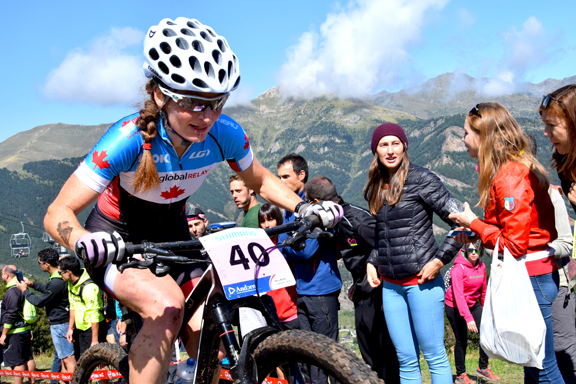 Good news: the Canadian women are still ranked second overall in the Olympic qualification (thanks to Catharine and Emily’s strong results) and I’m proud to be a part of the trio earning those points! Next year is going to be an exciting one! Thanks so much to the Cycling Canada MTB staff for making my job easy during the project and for keeping the mood positive, focused, and light. My Team Canada teammates also created a super-duper vibe, so it was a great atmosphere to be in and I believe it bred success. 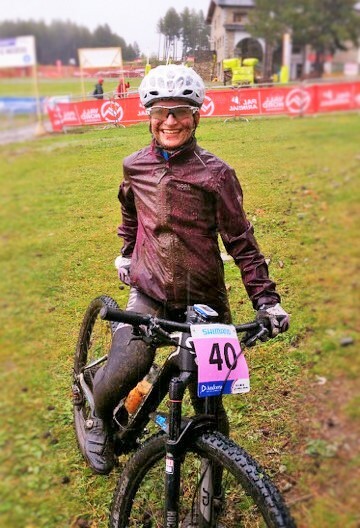 Thanks also to the guys at Giant Factory Racing for giving my bike a last-minute “anti-mud treatment” on race morning when I discovered that the course was an utter mire, plus for cheering me on and admitting association with me during my race despite the incredible drool string that I had going. Thanks also to everyone else who cheered me on — there were lots of Canadian teammates on the sidelines, along with their families, plus some Swissies and random guys singing “Oh Canada” and making marriage proposals. Thanks to my fantastic sponsors, who have supported me. 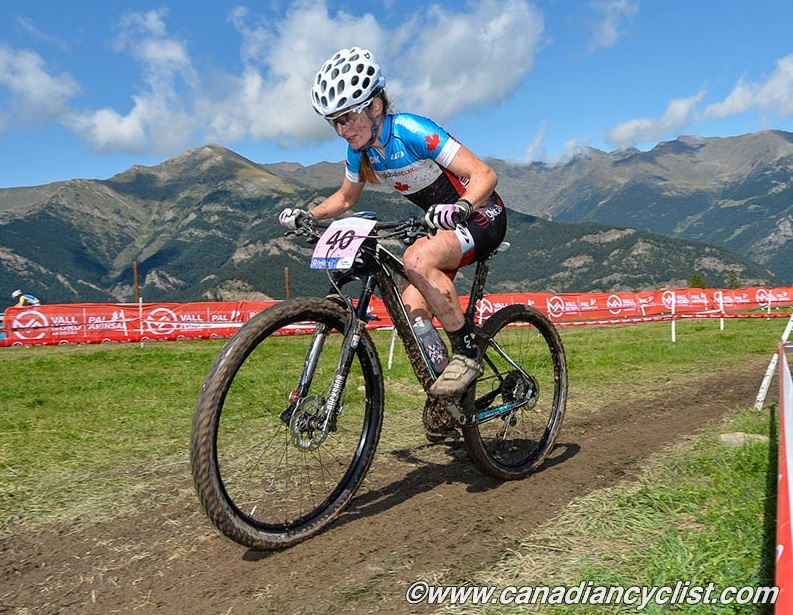 I couldn’t do this without you: Liv Cycling Canada, Giant Bicycles Canada, Shimano Canada, Q Drink Healthy, Kicking Horse Coffee, Catlike, Cycles Lambert, Golden Ears Physiotherapy, Team Giant Vancouver, Mom and Dad. Thanks to all my friends and training partners who helped me achieve my goals this year: Ryan, Steve, Rich, Paul, Kelsey, Andrew, Megan, and everyone else who agreed to ride with me. Thanks to Catharine for being a mega-rad training partner, and my super coach, Keith, for being a super coach! And now… OFF-SEASON (with a smattering of ‘cross)!